He can remember it like it was yesterday, he was just a boy of five or six. It was Christmas time and he was shopping with his mother when they heard the church steeple bells play. He stopped walking to take a listen, which forced his mother to stop walking as she was holding on to his hand so he wouldn't get lost amongst the other shoppers. Angrily she asked why he had stopped. With an innocent look, he met his mother's eyes and said 'aren't the bells pretty?' They didn't have much money then, no one did. But on Christmas day, his mother had given him a Christmas ornament in the shape of two bells. All he can think about are those bells. The sound of steeple bells and their beautiful song heard throughout the day, as they echo around his home town. He misses home. Here comes the artillery again! The trees start exploding around them as the enemy sends another barrage of artillery to their position. A shower of debris, tree limbs and such comes down upon them. The only thing they can do is take cover in their frozen foxholes. Even in his worst nightmares, he had never dreamt of anything like this. No one could have! Here they sit, freezing in a country most of them had never heard of before. He is on high alert as he sinks back down into the frozen ground of his foxhole. The snow lightly begins to fall. He is hypnotized by the gentleness of the snow as it dances towards the earth. It's cold. He is so cold that all he can do is shiver. He has never been this close to another man until now. Nonetheless personal space does not exist when you are freezing. What he would give to feel the warmth of a blazing fire. But they can't start a fire, for fear that the enemy will see them. They were crazy, but anyone would be crazy to advance with out supplies. Who would think to march a company into battle with no winter gear or food let alone no ammunition? The Company medic comes around about once an hour to check on them. What's to check? He thinks... I'm still cold and my belly is rumbling from hunger... and all he has to eat is the chocolate bar they usually give to the children of this God forsaken country. Mother's hot apple pie. His mouth waters just thinking about his Mother's hot apple pie. Heck, he'd even give his socks up for a piece of fruit cake, he's that hungry! It's Christmas and he prays that the good Lord above will not take him on this special day. Thinking about their families back home, the last thing that any of them wants is to die on Christmas. His stomach growls like a wild animal as he smells something wonderful. He had heard the medic call it Schwarzwurst. It don't matter what its called, it smells good. He fights off the urge to climb out of his foxhole and walk over to the enemy just for a bite. In the still of the night, the snow continues to fall. The silence is shattered as he hears a German begin to sing "Silent Night." A few moments later, the rest of the Germans join in. They are told not to sing, for it could be a ruse for the Germans to find them. He listens closely as he closes his eyes. The song brings him back home... to the bells of home. Christmas is the time of year when families and friends gather. It's a time for love, caring and sharing. It's that special time of the year when we all gather around the dinner table to feast while enjoying each other's company. Nonetheless, at some dinner tables there sits an empty chair. A chair that should be filled with a loved one. But that loved one is celebrating their Christmas away from home while bravely serving their country. Bluegrass group Circa Blue reminds you to reflect on those who are serving in our Military this Christmas with their new song "Bells of Home." Written by Dawn Kenney and David Morris, this song is performed in a light hearted and graceful melody as the story in the song takes place amid the Battle of the Bulge during Christmas of 1944. Although the story within the song is a somber one, the lyrics paint the perfect picture of a soldier who misses home at Christmas. It amazes me that seventy-two Christmases later, someone would recognize and show their respect for all the brave men who fought at the Battle of The Bulge, through song. "When we were talking about writing holiday songs, both for this project and for the holiday season in general; one of the things that came out of our discussions is that we knew that we wanted to write something to honor the people in service to our country. Many of whom are away from home at the holidays and don't get to spend the holidays with their loved ones like we do." shares songwriter Dawn Kenney. "Another thing we talked about was our World War II Veterans, there's not many survivors left. It has been over seventy years and not a lot of those folks are still with us. So we wanted to shine a light on that. When we thought about war time at Christmas, one of the things we were thinking about was the terrible Battle of The Bulge and that's where that song came from. We hoped it would reflect one person's experience in a way that is real common to a lot of folks." Circa Blue is a consolidation of five multi-talented musicians. Leading the vocals is Steve Harris who also plays guitar, their banjo player is Matt Hickman and is backed with the bass and vocal talents of Ashley Stewart. Malia Furtado lends her vocal talents as well as her expertise on the fiddle. While Ryan Mullins completes the ensemble with his mandolin, vocals and percussion capabilities. 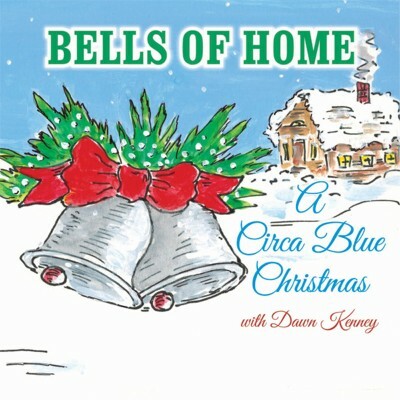 The quintet comes together with singer/songwriter Dawn Kenney to create a masterpiece Christmas album called Bells of Home: A Circa Blue Christmas. This album features ten elegant and delightful Christmas songs. Among the songs, are several timeless classics. These classics include a dazzling instrumental rendition of "God Rest Ye Merry Gentlemen" and a simple bluegrass version of "Away In A Manger." However, it's their bluegrass adaptation of "We Three Kings" that demands your attention. "That's Ryan our mandolin player. He's not a lead singer... I was kind of lettin' him show his personality." tells Steve Harris. "He'll be the first to tell ya that's the first recorded song he has ever sang lead on ever in his life. It's a fun tune and I really like our arrangement on that. Its fun to play, its fun to perform, we like that song." When you break this album down and take a close look at the artistry, you will find the arrangements quite unique and extraordinary. A superb example of Circa Blue's creativity is found in their interpretation of the classic hymn "In The Bleak Mid-Winter." Dawn Kenney takes the lead vocals, but it's Malia's passionate fiddle playing that awakens this long lost lullaby. As satisfying as these classic Christmas carols are, it is the new songs on this album that are more favorable and valuable. The band transports us back to the 1940's style of music with their song "Candy Cane Sweetheart." This song was written by Dawn with the help of her mother Joyce Kenney and her mother's twin sister Judy Grise. It is a fun ditty that is performed in a mild swing feel. This amusing tune sounds like it belongs in Bing Crosby's ever popular holiday film White Christmas as one can almost hear Rosemary Clooney taking the lead vocals. That same 1940's mentality can also be heard in the opening song "Snowflake or Two." While listening to this upbeat melody, one can take the lyrics in separate directions. The lyrics tend to have two meanings as they speak about heartache over a broken relationship or the heartache over not being able to share Christmas with a loved one, such as a soldier. As you progress through the album, you will find a slight twist amongst the beautiful harmonies. Dawn Kenney and David Morris team up again to entertain us with "Christmas In The Keys." The lyrics capture the romantic side of the holiday season as the melody is performed with a Caribbean charm. Although the highlight of the entire album is the title track, it is their song "Spirit of Christmas" that brings this entire album all together. Written by Paula Breedlove and Mark "Brink" Brinkman, this song emphasizes the importance of holding dear in our hearts the spirit of Christmas throughout the entire year. "I wrote the lyric after last Christmas while sadly undecking my halls." shares songwriter Paula Breedlove. "I was thinking that the Spirit of Christmas should last all year without the help of all the decorations. We shouldn't have to wait 'till Christmas to celebrate His birth." This amazing album closes with a rare and unprecedented song called "Happy Birthday Jesus." Presented as an a cappella, this arrangement exposes us to the pure, raw talent and tight harmonies that is Circa Blue. After listening to this simple, but elegant song, one can only demand more from this talented group of musicians. Strictly Country has always celebrated the artistry found in music. In our near twenty-four years in the industry, we have not found any other group, band or entertainer who posses the exquisite, dignified, awe-inspiring, extraordinary and glorious talent that is contained within Circa Blue. They maintain tight vocal harmonies mixed with creative arrangements of clean instrumentation. So much so that we have pulled three of their songs from this album and nominated them in the Spirit Award's Song of The Year and Spirit of Christmas Awards. These songs include "Snowflake or Two," "Candy Cane Sweetheart" and "Bells of Home." "Bells of Home" has also been graced with a nomination in the Spirit Award's inaugural category of Spirit of America Award for songs about soldiers. "I want to invoke the Christmas spirit. I want them to hear this album..." shares Steve. "I'd love for this to become... some or one song... to become classic stuff to where you hear it every year. Once people hear it, it invokes that Christmas spirit and makes people feel good and that its a good time of the year, it's Jesus' birth. That's the whole purpose of the music is to try and touch people. You want to reach people and you want to touch people. If you've done that, then you have accomplished what you set out to do..."
We invite you to listen to this album in it's entirety on Strictly Country's Friday night radio show - Around The Campfire as Circa Blue helps kick off our 23rd Annual Northwoods Country Christmas. All Contests for this show have ended.